a href="http://singaporelocalfavourites.com/1.bp.blogspot/-mpCc0srk4mc/TWDBlhl4oGI/AAAAAAAABxw/fu2WrNVvo20/s1600/teh tarik.jpg" imageanchor="1" style="clear: left; float: left; margin-bottom: 1em; margin-right: 1em; Teh tarik (literally pulled tea in English) is a hot, sweet tea beverage which can be commonly found in Indian restaurants, Indian hawker stalls and kopi tiams in Singapore. 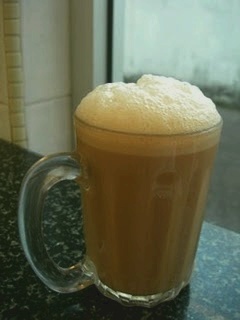 Its name, "Teh tarik" is derived from the pouring process of "pulling" the drink during preparation. Teh Tarik is made from black tea, condensed milk and some ginger juice; may be added which is commonly called "Teh Sarbat" or "Teh Halia" (Ginger Tea). This drink is also consumed together with roti prata and spicy Indian Dishes! In a teapot or other non-reactive container, pour boiling water over tea leaves. Steep 10 minutes (this makes a wickedly strong brew). Strain tea into a large vessel with an easy-to-grip handle (such as a large measuring cup) containing the sweetened condensed milk. Tarik or "Pull" the tea by pouring it back and forth into another container in a long stream to generate froth. The longer the stream, the frothier the brew (at least 12 inches / 30 c.). Take your time and be careful, splatters from this can burn. Serve the Teh Tarik quickly, before it deflates.